This program promotes the development of systems and technology for advanced measurement and analysis in order to meet frontier needs in academic research as well as industrial research and production. Our aime is developping innovative systems and technologies in advenced maeasurement and analysis fields via four programs fitting to the diverse stage of technology commercialization. Each year, JST widely calls for proposals of academia-industrial partnership. JST-SENTAN program promotes development of systems and technologies for advanced measurement and analysis, in order to meet high expectation from frontier research and manufacturing area. Three support types are set to promote efficiently each development project. JST widely calls for proposals, reviews them and selects approval projects. 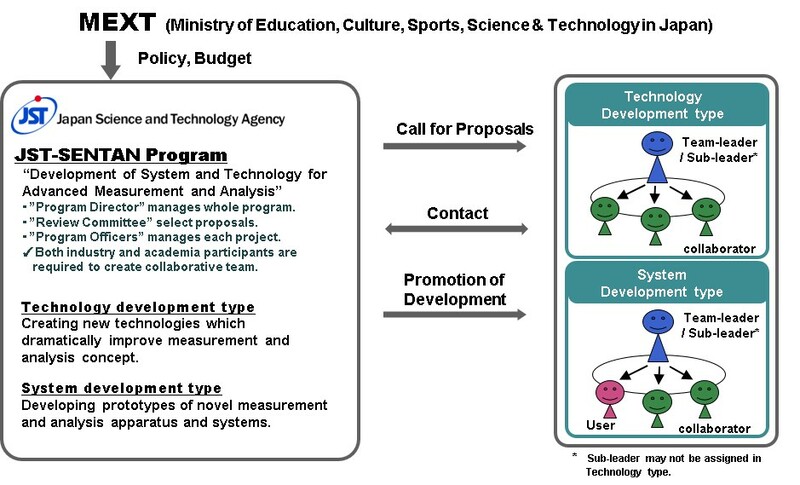 Development teams must include both industry and academic participants. In addition to our original support types, priority development areas are set since FY2012, after scientific, technological and social issues. Copyright ©2003-2018 Japan Science and Technology Agency All rights reserved.